If you need a better garage, you can rely on Custom Garage Works! We have been offering a selection of custom garage services such as garage floor coating in Arlington, TX since we first opened in 2003. After looking high and low in the existing industry, we were surprised to find very few options that were up to a professional standard, so we got into the industry ourselves, to turn things around. Now, we proudly provide professional garage organization solutions, along with top-of-the-line polyurea polyaspartic floor coatings, that have a significantly longer lifespan than epoxy. 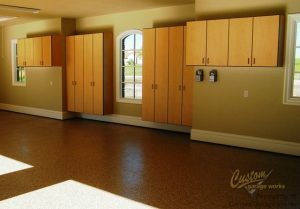 We are passionate about fantastic garages, and while we began with a simple garage floor coating service, we are happy to provide many additional custom garage solutions to the DFW area. 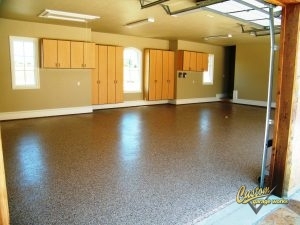 Our custom garage floor coating in Arlington, TX is one of our most common garage services! This boom in popularity is probably because our coatings are stronger than epoxy, and cure faster, which means that you can drive in your garage within 24 hours in most scenarios. While with epoxy floor coatings, you need to avoid UV exposure and be on the watch for flaking, our polyurea-based floor coatings are significantly more durable. In addition to our floor preparation, which includes professional diamond grinding, as opposed to acid etching, you end up with a showroom quality floor that is easy to clean, and practically indestructible. Give us a call at 214-494-9068 or 817-308-1305 for your free estimate now, and we can tell you more about our professional garage floor coating service. If you are running out of space in your garage, Custom Garage Works has the perfect garage storage and organization solution for your home! Your garage looks greatest when it is tidy and organized. We offer a selection of solutions to sort your belongings, including overhead storage racks as well as garage cabinets. All of our garage cabinets are secured to the wall for additional safety, and our overhead storage racks are stronger and more dependable than the others you will find on the market. If you need a reliable garage floor coating in Arlington, TX, and unmatched organization solutions, you can depend on Custom Garage Works. Storage Cabinets Unlike traditional cabinets, these are designed specifically to help you get the most out of your garage storage! Car Lifts Our car lifts help you store your vehicle with style and accessibility, and they will not scar your new floors! And More! Don’t be concerned by clutter in your garage any more. We have the organization solutions you requires!